As reported on sites such as The Verge and Naked Security earlier this year, Microsoft has discontinued support and security updates for older versions of their Internet Explorer browser. 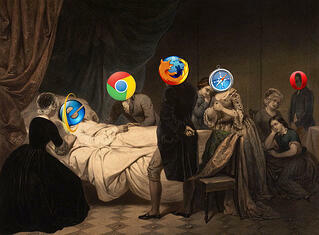 IE 6 and 7 are already ancient history, but this recent announcement also adds IE 8, 9, and even 10 to the pile. What this means for end users and businesses alike is that machines running these older versions will become increasingly insecure and vulnerable to attacks and unwelcome hacking attempts. Anyone serious about web security, safeguarding their personal information, and protecting the PCs on their networks should immediately upgrade to IE 11 or Edge, the next generation of browser software from Microsoft. An announcement was made last fall that the end was coming for these older iterations, prompting many users to proactively upgrade their machines; however, it is estimated that hundreds of millions of others are still running these obsolete browser versions, giving hackers a plethora of juicy targets from which to choose. There are also implications regarding HIPAA compliance and ISV support, meaning that any verticals that touch the medical industry and companies that use vendor software (including Office 365) are encouraged to upgrade right away to keep things running smoothly. What this also means is that web development firms like Page One will be focusing their browser compatibility efforts on IE 11 and Edge (in addition to current versions of browsers such as Chrome, Firefox, and Safari), and concerning themselves less and less with getting sites to work on IE 10 and below. In addition to increases in security and speed, IE 11 and Edge boast better support for the newest web standards that are being put into place across the net, meaning that users still clinging to their old versions of IE will simply be unable to view and interact with modern sites the way that they were designed to be used. So, for all you Internet Explorer fans out there, upgrade to IE 11 or Microsoft Edge today. Do it for your business, do it for your customers, and do it for your own peace of mind. Your users (and your internet marketing agency) will love you for it.